I found your wonderful site quite by accident. I was attempting to find the whereabouts of an old friend. 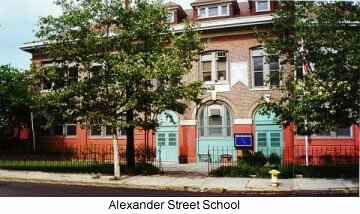 We were classmates at Alexander Street School. I was surprised to find out that the old school was still in operation. I was born April 11, 1938 in Montclair and my family moved to Munn Avenue at the beginning of the US involvement in WWII, probably 1941. My father (Zelic "Ray" Caro, deceased) went off to war and my mother (Hannah Marx Caro, deceased) went to work in a defense plant, Hyatt Bearings in Kearny. That is how we were able to get an apartment on Munn Avenue. After the war she worked at Bamberger's Department Store in Newark. Principal, Genevieve Yelton (Great Lady). The school building was in two parts, Front (Alexander Street) was the old half. Behind the school an old woman set up a candy store in her basement. He establishment was known as "Nancy's." Whether you had just a penny or on the rare occasion when one of us had a nickel, at the end of the day, Nancy had it all. During the war, Vailsburg Park had a anti-aircraft gun battery housed on the north end of the park. We grew, as did many of our neighbors, a Victory Garden within the area know as Joseph P. Bradley Court. Meadowbrook Bowl was an outdoor boxing arena located on South Orange Avenue across from Vailsburg Park. Wrestling matches were televised from that location on Channel 13 every Friday night. It was replaced by a supermarket. Pizza was sold there as an ethnic food. It was Tomato Pie. Students could get discount bus tickets to ride the "31" at the terminal located at the corner of Dover Street and South Orange Avenue.